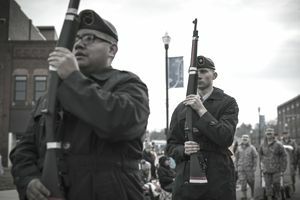 The Simultaneous Membership Program (SMP) is a program that allows for people to be a part of both the National Guard and your college’s ROTC program. The immediate benefits are being able to use the tuition assistance of the GI Bill after a year of service in the Guard or Reserves. Qualifying for up to 100 percent tuition with the Guaranteed Reserve Forces Duty (GRFD) scholarship is the major financial benefit you receive from this program. You must be a full-time college student (sophomore, junior, senior, or grad students eligible). You must also be serving (or willing to enlist) in the Army Reserves (USAR) or Army National Guard (ARNG). And you must be enrolled in Army ROTC at the college you attend. In the SMP, a cadet will participate in monthly unit training with your USAR or ARNG one weekend a month and get paid to drill once a month with your Guard unit. You do have to attend Army Basic Combat Training and join the National Guard or Reserves. Then you must be eligible for the ROTC program at the college you attend or plan to attend. Many ROTC students join the ROTC program as a non-contracted cadet, meaning they must pay for their tuition at college. Depending upon their performance and eligibility they may earn a slot as a contracted cadet — receiving an ROTC scholarship and a commitment of service after graduation. Only ROTC contracted cadets may participate in the Simultaneous Membership Program. However, you cannot join the SMP if you are receiving an ROTC scholarship. If you join the SMP two-year training course, you'll be receiving training from the National Guard unit officers, while earning your commission through college courses and ROTC. Upon college graduation, you have several options that most ROTC, OCS, and Academy Graduates do not have. You can still become commissioned as an officer in the Army. However, you also have the option of serving full-time or part-time in the Army Reserves or Army National Guard. You will receive basic soldier skills in Basic Combat Training (BCT) and job skills Advanced Individual Training (AIT). Depending on your Military Occupational Specialty (MOS), you can receive up to 100 percent tuition assistance. SMP cadets receive timed served credit towards reserve retirement, and base pay calculations. Depending upon your rank/grade, you receive a monthly allowance. With the Montgomery GI Bill and Guard Kicker, you are eligible for money for tuition/expenses. Upon graduation, you will commission as a second lieutenant and be able to serve in either the National Guard or the Active Army. Non-deployable status — You will not have to deploy since you are enrolled in college. And of course, officer training in your National Guard/Reserve Unit when performing your required drill. You need one year of college completed prior to applying for the SMP. You are eligible for SMP at the beginning of your sophomore year. However, a freshman can still enroll in ROTC classes, and drill with the National Guard unit, but you will not be formally in the SMP. If you are a sophomore or higher and currently enlisted, you must enroll in the SMP to enroll in ROTC. Prospective cadets with prior military experience may simply be assigned to a unit. If you are a civilian, you get to attend Army Basic Training and become a soldier in the National Guard. After Basic Combat Training (BCT) and Advanced Individual Training (AIT) during the summer (typically in between high school graduation and freshman year), a new graduate from Basic Training will be assigned to a local National Guard or Reserve unit upon completion of training. NOTE: It is possible to join the ARNG and enroll in ROTC without going to Basic Training, but without Basic Training and AIT you are only eligible for a fraction of the tuition benefits available. However, completing BCT and AIT will be helpful to your military career introduction. BCT/AIT will take longer than the typical college summer breaks, so you may have to miss a semester of classes to complete this training. The amount of financial aid you are eligible for is substantial (3 years plus expenses) and well worth the delayed semester. Upon commissioning, any enlistment contract is nullified, and you may start your career as an Army officer and serve either full-time on Active Duty, or part-time as an officer in the USAR or ARNG. You are not limited to any particular MOS because of your former training, nor are you locked into or out of any commissioning options. If you have desires to serve in the Reserves or National Guard, there is a Guaranteed Reserve Forces Duty (GFRD) contract that means you will be given a Reserve Commissioning and not go Active Duty. All cadets at the end of their junior year can request Active Duty (career MOS), USAR, or ARNG. Also, to differentiate the SMP from other commissioning sources, participation in the SMPT is not required for GRFD contracting. Those who contract and become SMP participants must complete selected ROTC Cadet Forms of the command/college you attend as well as the standard USAR/ARNG forms. If you missed the opportunity to receive an ROTC scholarship or Service Academy Appointment, this program offers the same benefits toward tuition and more.